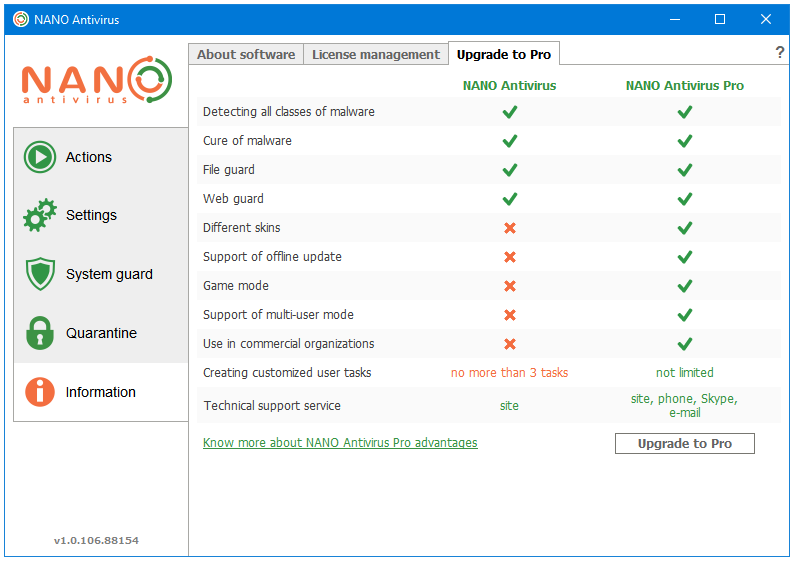 Home » PC » Antivirus & Security » NANO Antivirus Free 2019 Review – Full-Featured Protection for Windows 10. 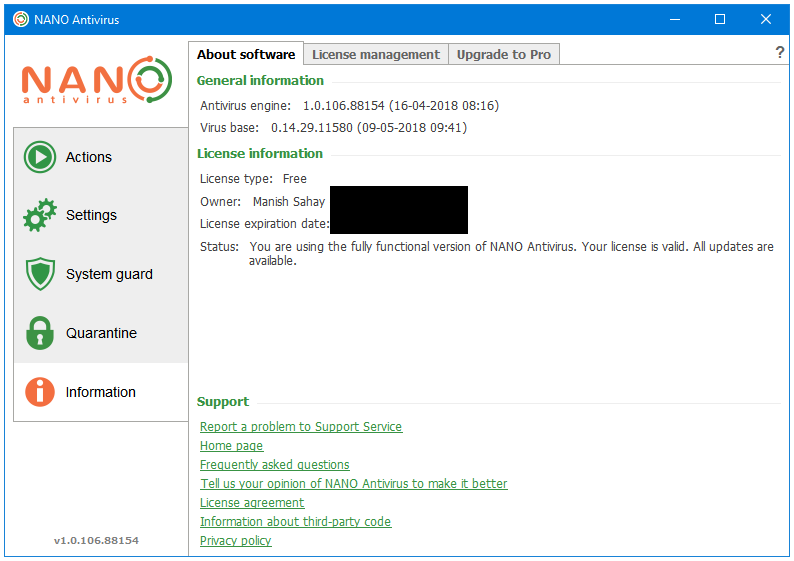 NANO Antivirus Free 2019 Review – Full-Featured Protection for Windows 10. Best Free Antivirus Products for Windows PC in 2019 – NANO Antivirus Free. NANO Antivirus protects the user computer in real-time from all types of malware using their Signatures, Heuristics Analysis, Web Protection, and Cloud technologies. Most of the Free Antivirus products are the lighter or the stripped down version of the main paid product. Some of them are more like a promotion rather than a free version. However, that’s not the case with NANO Antivirus, which is a full-featured Antivirus program. NANO is what most of the famous Antivirus products of today looked like way back when they were getting famous. When they had few or no paid products to offer. And, their free versions had none to minimal advertisements and promotions. In the December 2018 report of VB100, NANO Passed the VB100 test. AV-TEST did not test NANO in their most recent test. AV-Comparatives did not test NANO in their most recent test. The NANO Antivirus opens to the Quick start tab in the Actions section. There are five sections in NANO that cover everything about this Antivirus. Actions is the default window of NANO Antivirus. It provides the important computer security information in the following two tabs. Quick start – The Quick start tab provides an overview of the system protection settings. 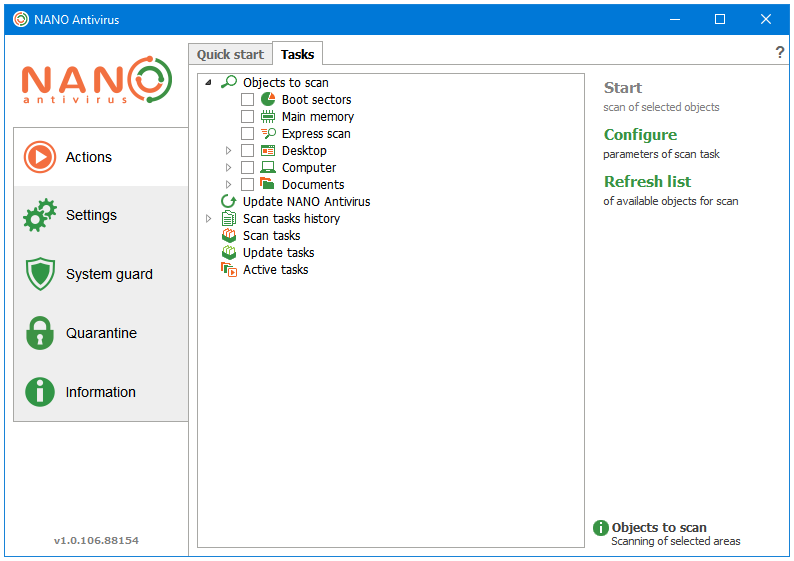 Tasks – Tasks is the scheduled scan feature by NANO. You can configure and customize your scans using various settings such as file types to scan, objects to scan, actions on threat detection, etc. ; and then save them as Tasks. 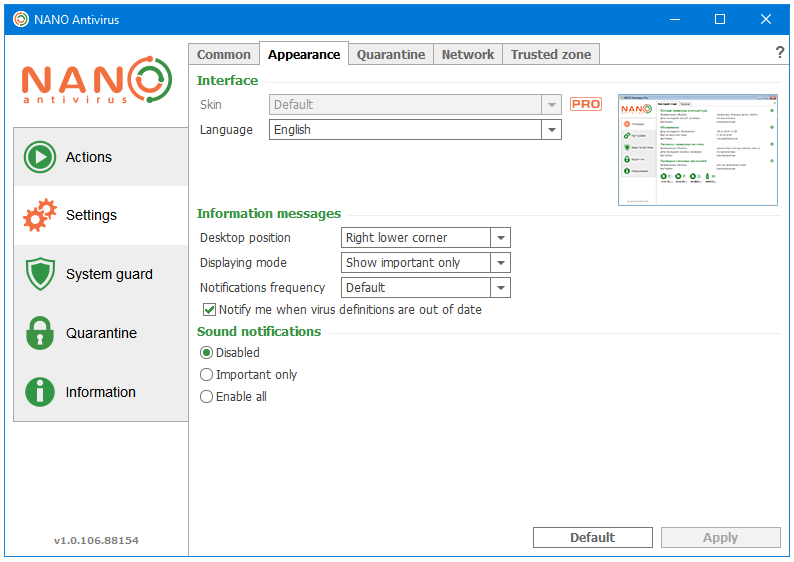 The Free version of NANO Antivirus lets the user create three tasks at most. 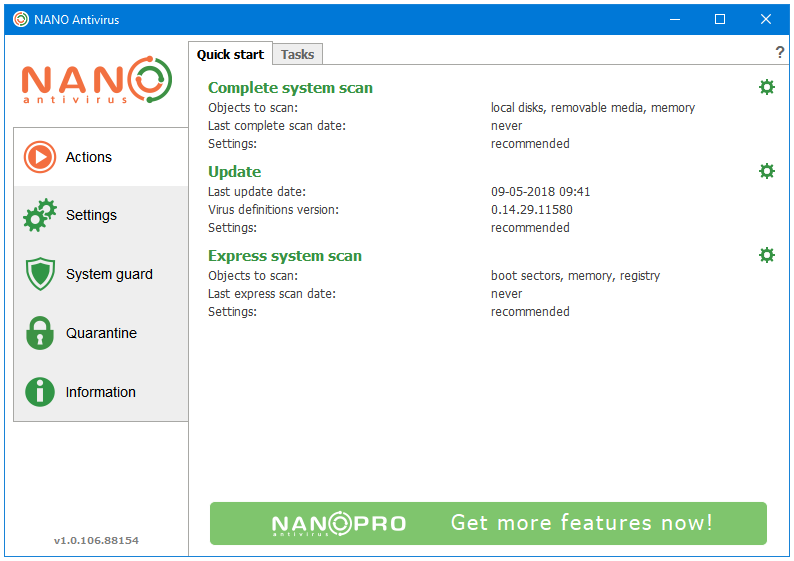 NANO Antivirus supports six types of scans, these are – Boot Sector Scan, Main Memory Scan, Express Scan, Custom Scan, Scheduled Scan, and Automatic Removable Media Scan. All of the program settings are divided into the following five tabs under the Settings section. Common – The Common tab gives you an overview of some of the basic miscellaneous settings. Appearance – In the Appearance tab, you can access the settings related to the customization of the program appearance. 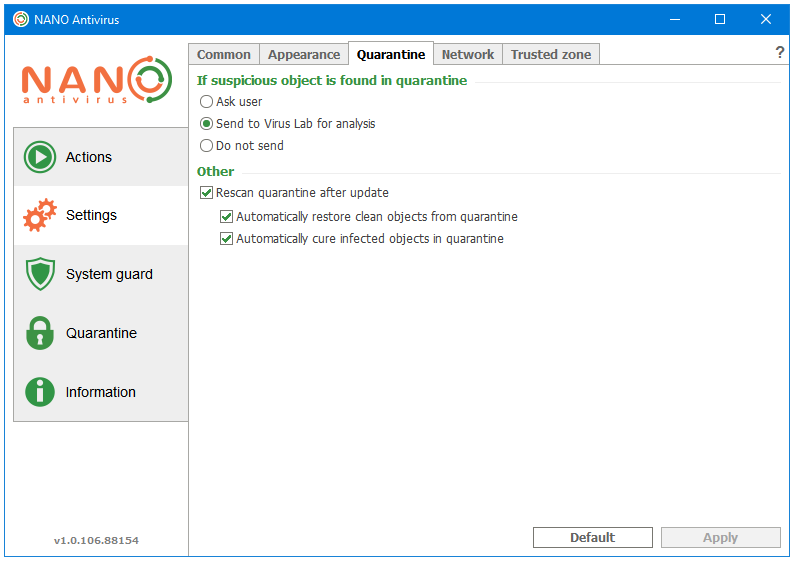 Quarantine – The Quarantine option in the Settings tab displays the settings related to the Quarantine objects feature. If you want to visit the Quarantine objects location, then you can do that by clicking on the Quarantine button in the sidebar. Network – The Network tab lets the user set a proxy server. Trusted zone – Trusted zone is like a white-listing or an exclusion feature. You can add files and folders in the trusted zone, and NANO will assume them to be legitimate files, and exclude them from scanning and the system guard working. 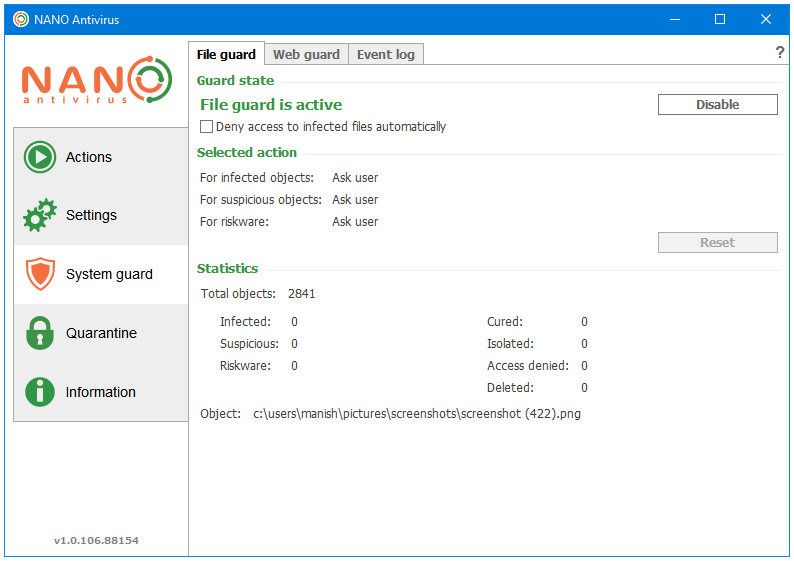 System Guard is the main Antivirus component of NANO. It uses two real-time anti-malware shields to protect the user computer from malware attacks. File Guard – The File Guard is responsible for protecting system from file execution related threats. 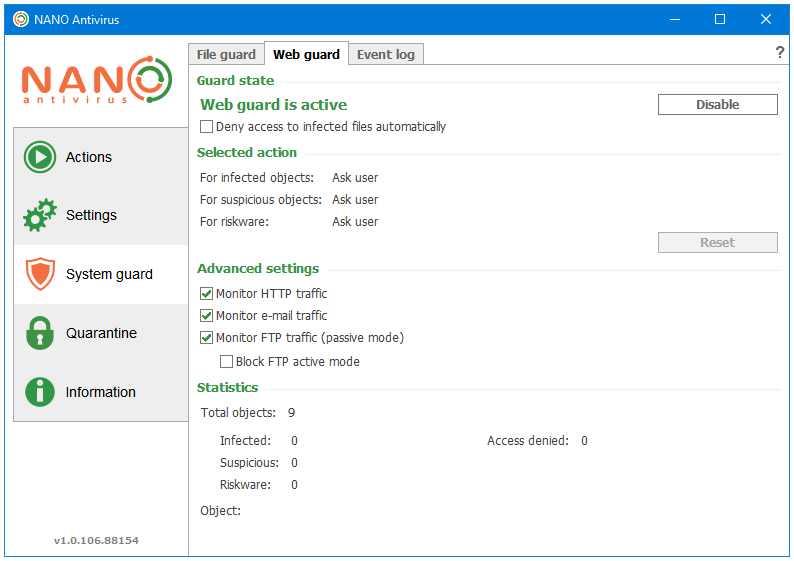 Web Guard – The Web Guard provides protection from the Internet-borne threats. It monitors all kinds of Network traffic to block any malicious or phishing attempts. 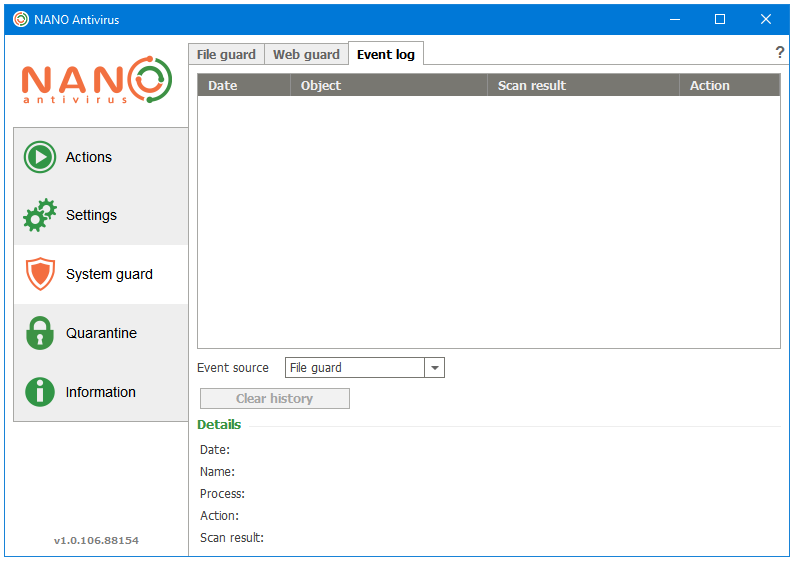 Event log – The Event log logs and displays the antivirus and computer security related events. The Quarantine section the following three tabs. Quarantine objects – When you right-click on a file on your computer, you see two entries by NANO Antivirus on the context menu. 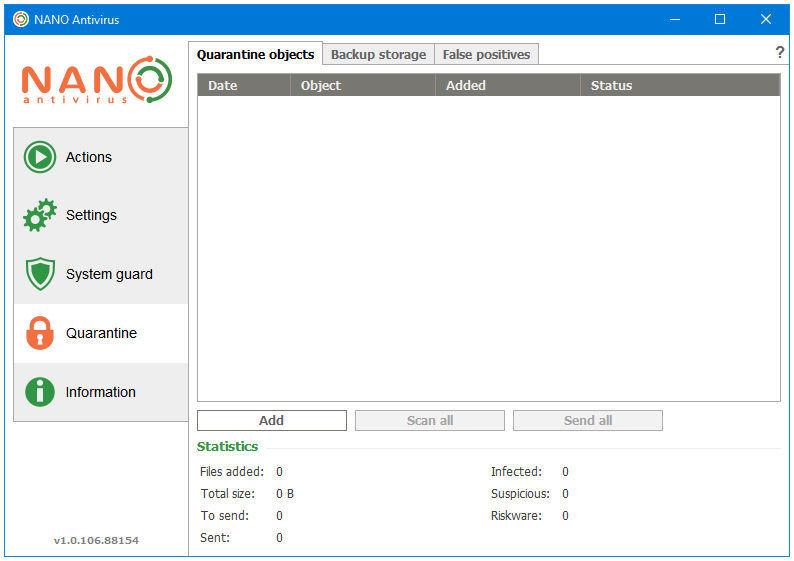 The first one is called Scan with NANO Antivirus, and the second one is called Place to NANO Antivirus quarantine. The items sent to the Quarantine are found in this window. Backup storage – The Backup storage window displays all of the items that were detected as malware by the Antivirus. You can perform additional actions on these items present here such as Restore or Remove. False positives – The False positives are listed here. The Information section has the following three tabs that display the product and user license related information. About software – The About software tab displays the details about the antivirus engine and virus base versions, and other support links. 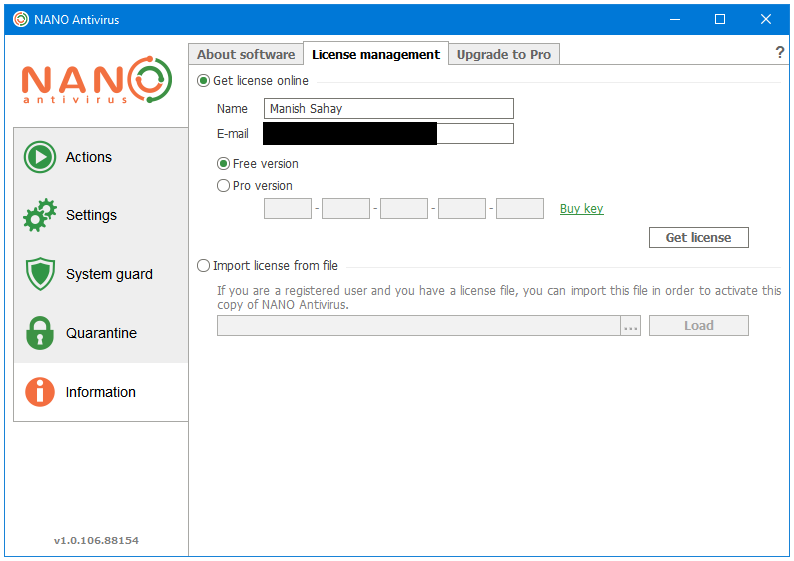 License management – Here, under License management, you can see your product license details. Upgrade to Pro – As the name suggests, Upgrade to Pro is an advertisement for the NANO Antivirus Pro. Hard Disk Used: In order to download and install NANO Antivirus, you first need to download their online installer, which is around 10 MB in size. The installer then downloads 600 MB of data, which includes the Antivirus setup file. When the download completes, the installer starts the installation process. After installation and an update, the NANO Antivirus Free uses around 1.50 GB of the disk space. CPU and RAM Usage When Idle: NANO uses about 100 MB of your RAM when it is idle. The CPU usage is stable at 0%. 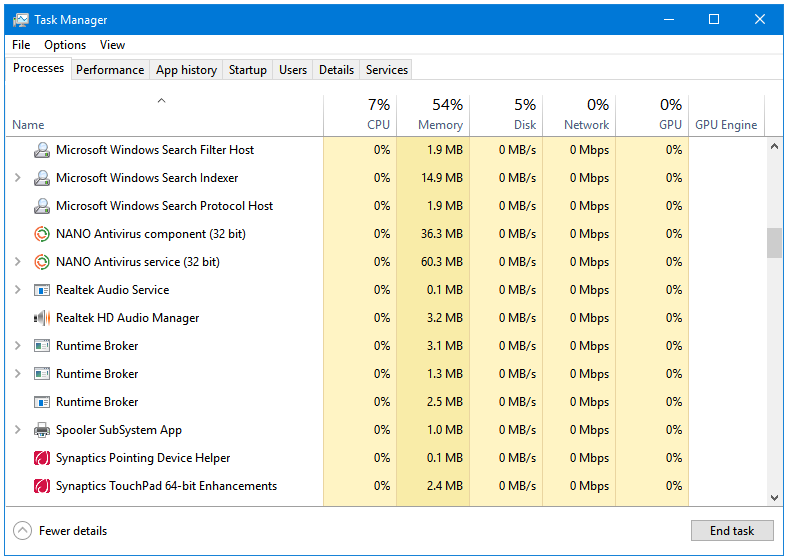 CPU and RAM Usage When Scanning: During a Full system scan, NANO uses around 200 MB of RAM. 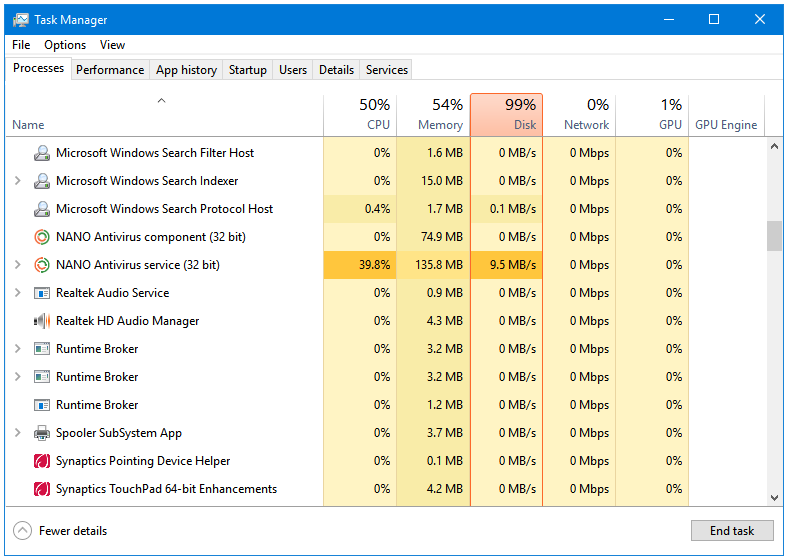 NANO uses a good amount of CPU power while performing a Full system scan; the CPU usage fluctuates between 20 and 60%, and is stable at around 35%. Going through each setting of this program is super easy. NANO uses a nice tabbed interface. 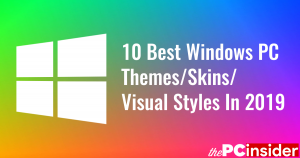 A total of 16 tabbed windows are arranged inside 5 sections. A very easy on the eyes colour scheme is used. NANO also has Skin support, however, that’s available only in the Pro version. There is one small non-intrusive banner image at the bottom of the Quick start tab in the Actions section of the program, which is also the Home screen of NANO Antivirus. There is also one comparison table between the Free and Pro versions in the Upgrade to Pro tab under the Information section. Occasionally, you get an alert window at the bottom-right corner of your computer reminding you to Upgrade to Pro. 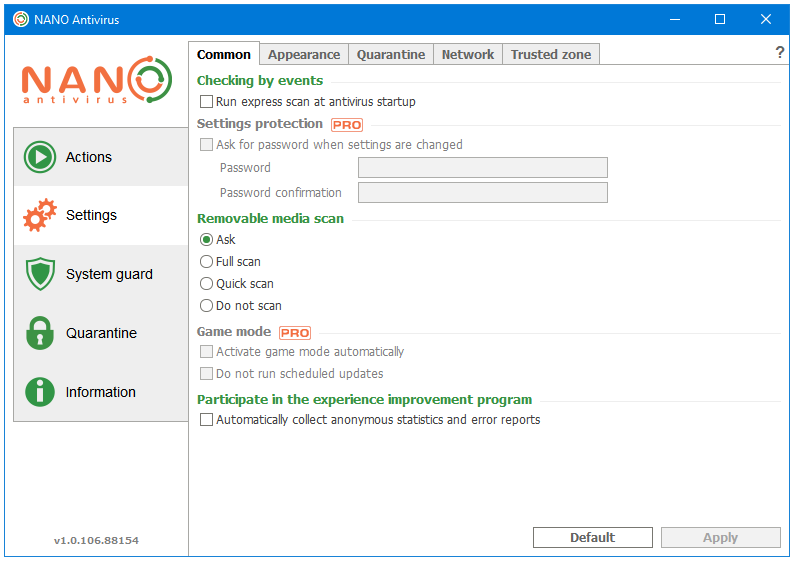 Panda Dome Free Antivirus 2019 Review – Feature-Rich Lightweight Protection for Windows 10. FortiClient Free Antivirus 2019 Review – Industry-Grade Protection for Windows 10. Forticlient is a solid AV. I have used it off/on for about 4 years now. It has been greatly improved since the first version. In addition to standard AV signatures, it now seems to offer a bit of behavorial detection, and the web filter is excellent. It seems that it has to be connected to a Fortinet appliance before you can submit a file to them, but you can probably submit a file at their website. I agree that it is underrated, and I give it a solid 4/4.5 rating. I am an independent malware analyst, and I am not connected with Fortinet/Forticlient. FortiClient has gained some attraction due to the YouTube video reviews in recent years. I remember using it briefly around 2009. It has become a much better and a complete antivirus product now. I’m yet to use and review the newly released version 6.0.